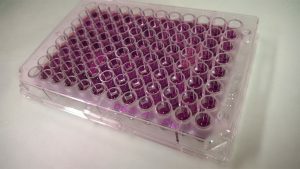 Current methods of assessing iodine status in populations rely on measuring urinary iodine in sufficiently large samples. As urinary iodine varies with daily intake, multiple measurements would be necessary to assess the iodine status in individuals. Due to the high intra-individual variability, urinary iodine concentrations can only be used as marker for assessing the iodine status in larger populations. In contrast, Thyroglobin (Tg), as measured from dry blood spots (DBS) promises more stability as a biomarker. The WHO have tentatively recommended thyroglobulin testing as a biomarker for children, but stated that more work is required to establish it as a biomarker for other population groups. EUthyroid will be the first project to evaluate thyroglobulin as a functional biomarker for individual iodine status. Determining whether maternal DBS-Tg is a suitable marker for the neurocognitive function of their offspring.